From the day that the ark was lodged at Kiriath-jearim, a long time passed, some twenty years, and all the house of Israel lamented after the LORD. Then Samuel said to all the house of Israel, "If you are returning to the LORD with all your heart, then put away the foreign gods and the Astartes from among you. Direct your heart to the LORD, and serve him only, and he will deliver you out of the hand of the Philistines." So Israel put away the Baals and the Astartes, and they served the LORD only. Then Samuel said, "Gather all Israel at Mizpah, and I will pray to the LORD for you." So they gathered at Mizpah, and drew water and poured it out before the LORD. They fasted that day, and said, "We have sinned against the LORD." And Samuel judged the people of Israel at Mizpah. When the Philistines heard that the people of Israel had gathered at Mizpah, the lords of the Philistines went up against Israel. And when the people of Israel heard of it they were afraid of the Philistines. The people of Israel said to Samuel, "Do not cease to cry out to the LORD our God for us, and pray that he may save us from the hand of the Philistines." So Samuel took a sucking lamb and offered it as a whole burnt offering to the LORD; Samuel cried out to the LORD for Israel, and the LORD answered him. As Samuel was offering up the burnt offering, the Philistines drew near to attack Israel; but the LORD thundered with a mighty voice that day against the Philistines and threw them into confusion; and they were routed before Israel. And the men of Israel went out of Mizpah and pursued the Philistines, and struck them down as far as beyond Beth-car. Then Samuel took a stone and set it up between Mizpah and Jeshanah, and named it Ebenezer; for he said, "Thus far the LORD has helped us." So the Philistines were subdued and did not again enter the territory of Israel; the hand of the LORD was against the Philistines all the days of Samuel. The towns that the Philistines had taken from Israel were restored to Israel, from Ekron to Gath; and Israel recovered their territory from the hand of the Philistines. There was peace also between Israel and the Amorites. Samuel judged Israel all the days of his life. He went on a circuit year by year to Bethel, Gilgal, and Mizpah; and he judged Israel in all these places. Then he would come back to Ramah, for his home was there; he administered justice there to Israel, and built there an altar to the LORD. Now during those days, when the disciples were increasing in number, the Hellenists complained against the Hebrews because their widows were being neglected in the daily distribution of food. 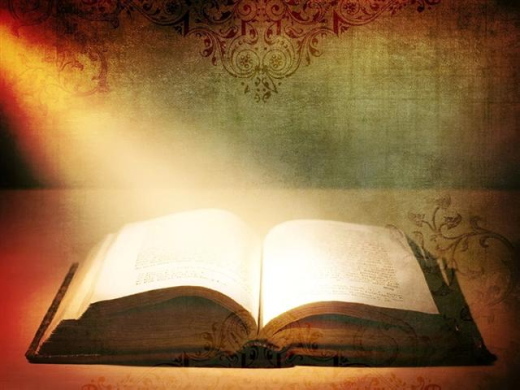 And the twelve called together the whole community of the disciples and said, "It is not right that we should neglect the word of God in order to wait on tables. Therefore, friends, select from among yourselves seven men of good standing, full of the Spirit and of wisdom, whom we may appoint to this task, while we, for our part, will devote ourselves to prayer and to serving the word." What they said pleased the whole community, and they chose Stephen, a man full of faith and the Holy Spirit, together with Philip, Prochorus, Nicanor, Timon, Parmenas, and Nicolaus, a proselyte of Antioch. They had these men stand before the apostles, who prayed and laid their hands on them. The word of God continued to spread; the number of the disciples increased greatly in Jerusalem, and a great many of the priests became obedient to the faith. Stephen, full of grace and power, did great wonders and signs among the people. Then some of those who belonged to the synagogue of the Freedmen (as it was called), Cyrenians, Alexandrians, and others of those from Cilicia and Asia, stood up and argued with Stephen. But they could not withstand the wisdom and the Spirit with which he spoke. Then they secretly instigated some men to say, "We have heard him speak blasphemous words against Moses and God." They stirred up the people as well as the elders and the scribes; then they suddenly confronted him, seized him, and brought him before the council. They set up false witnesses who said, "This man never stops saying things against this holy place and the law; for we have heard him say that this Jesus of Nazareth will destroy this place and will change the customs that Moses handed on to us." And all who sat in the council looked intently at him, and they saw that his face was like the face of an angel. When the hour came, he took his place at the table, and the apostles with him. He said to them, "I have eagerly desired to eat this Passover with you before I suffer; for I tell you, I will not eat it until it is fulfilled in the kingdom of God." Then he took a cup, and after giving thanks he said, "Take this and divide it among yourselves; for I tell you that from now on I will not drink of the fruit of the vine until the kingdom of God comes." 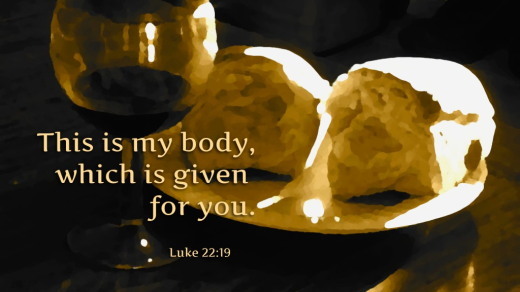 Then he took a loaf of bread, and when he had given thanks, he broke it and gave it to them, saying, "This is my body, which is given for you. Do this in remembrance of me." And he did the same with the cup after supper, saying, "This cup that is poured out for you is the new covenant in my blood. But see, the one who betrays me is with me, and his hand is on the table. For the Son of Man is going as it has been determined, but woe to that one by whom he is betrayed!" Then they began to ask one another, which one of them it could be who would do this. 1 I will sing of mercy and justice; to you, O LORD, will I sing praises. 2 I will strive to follow a blameless course; oh, when will you come to me? I will walk with sincerity of heart within my house. 3 I will set no worthless thing before my eyes; I hate the doers of evil deeds; they shall not remain with me. 4 A crooked heart shall be far from me; I will not know evil. 5 Those who in secret slander their neighbors I will destroy; those who have a haughty look and a proud heart I cannot abide. 6 My eyes are upon the faithful in the land, that they may dwell with me, and only those who lead a blameless life shall be my servants. 7 Those who act deceitfully shall not dwell in my house, and those who tell lies shall not continue in my sight. 8 I will soon destroy all the wicked in the land, that I may root out all evildoers from the city of the LORD. 1 Hold not your tongue, O God of my praise; for the mouth of the wicked, the mouth of the deceitful, is opened against me. 2 They speak to me with a lying tongue; they encompass me with hateful words and fight against me without a cause. 3 Despite my love, they accuse me; but as for me, I pray for them. 4 They repay evil for good, and hatred for my love. 5 Set a wicked man against him, and let an accuser stand at his right hand. 6 When he is judged, let him be found guilty, and let his appeal be in vain. 7 Let his days be few, and let another take his office. 8 Let his children be fatherless, and his wife become a widow. 9 Let his children be waifs and beggars; let them be driven from the ruins of their homes. 10 Let the creditor seize everything he has; let strangers plunder his gains. 11 Let there be no one to show him kindness, and none to pity his fatherless children. 12 Let his descendants be destroyed, and his name be blotted out in the next generation. 15 Because he did not remember to show mercy, but persecuted the poor and needy and sought to kill the brokenhearted. 16 He loved cursing, let it come upon him; he took no delight in blessing, let it depart from him. 18 Let it be to him like the cloak which he wraps around himself, and like the belt that he wears continually. 19 Let this be the recompense from the LORD to my accusers, and to those who speak evil against me. 20 But you, O Lord my God, oh, deal with me according to your Name; for your tender mercy's sake, deliver me. 21 For I am poor and needy, and my heart is wounded within me. 22 I have faded away like a shadow when it lengthens; I am shaken off like a locust. 23 My knees are weak through fasting, and my flesh is wasted and gaunt. 24 I have become a reproach to them; they see and shake their heads. 25 Help me, O LORD my God; save me for your mercy's sake. 26 Let them know that this is your hand, that you, O LORD, have done it. 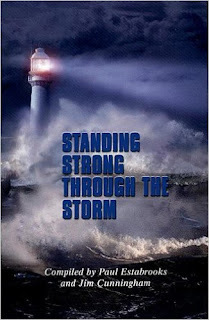 27 They may curse, but you will bless; let those who rise up against me be put to shame, and your servant will rejoice. 28 Let my accusers be clothed with disgrace and wrap themselves in their shame as in a cloak. 30 Because he stands at the right hand of the needy, to save his life from those who would condemn him. 121 I have done what is just and right; do not deliver me to my oppressors. 122 Be surety for your servant's good; let not the proud oppress me. 123 My eyes have failed from watching for your salvation and for your righteous promise. 124 Deal with your servant according to your loving-kindness and teach me your statutes. 125 I am your servant; grant me understanding, that I may know your decrees. 126 It is time for you to act, O LORD, for they have broken your law. 127 Truly, I love your commandments more than gold and precious stones. 128 I hold all your commandments to be right for me; all paths of falsehood I abhor. 129 Your decrees are wonderful; therefore I obey them with all my heart. 130 When your word goes forth it gives light; it gives understanding to the simple. 131 I open my mouth and pant; I long for your commandments. 132 Turn to me in mercy, as you always do to those who love your Name. 133 Steady my footsteps in your word; let no iniquity have dominion over me. 134 Rescue me from those who oppress me, and I will keep your commandments. 135 Let your countenance shine upon your servant and teach me your statutes. 136 My eyes shed streams of tears, because people do not keep your law. 137 You are righteous, O LORD, and upright are your judgments. 138 You have issued your decrees with justice and in perfect faithfulness. 139 My indignation has consumed me, because my enemies forget your words. 140 Your word has been tested to the uttermost, and your servant holds it dear. 141 I am small and of little account, yet I do not forget your commandments. 142 Your justice is an everlasting justice and your law is the truth. 143 Trouble and distress have come upon me, yet your commandments are my delight. 144 The righteousness of your decrees is everlasting; grant me understanding, that I may live. Heavenly Father, I remember today all the many people who damage or destroy their lives with one of the thousand obsessions that can plague the human mind: The alcoholic and addict; those with eating disorders; those with sexual compulsions; those who are driven to obsessive gambling; the superstitious; those who hoard obsessively and live in squalor; those whose only concern is their appearance, or wealth; or any of the myriad, baffling, and often bizarre behavioral disorders that may affect and burden the lives of your people. put some steam in your engine! Peter told them, "You know it is against our laws for a Jewish man to enter a Gentile home like this or to associate with you. But God has shown me that I should no longer think of anyone as impure or unclean." It’s very easy to rail against someone caught up in a certain sin until we personally know one of these people. It might be a close friend, or it might be a family member. Maybe we know someone who has a child who has gone astray. Maybe our own child has gone astray. And now all of a sudden when it is on our front porch, it isn’t the same. Now there is a face attached to the sin. And it is much more difficult to be so disconnected, austere, and sharp. I am not suggesting the sin is any less a sin. But I am saying that when it is connected to someone we know, we suddenly see it a little bit differently. There is a little more compassion for that person, and we want to help instead of simply condemn him or her. God called Peter and the rest of the apostles to take the gospel to the whole world—not just to the Jewish world. But after six years had passed, this new group of believers was pretty much staying within the confines of Judaism. This was not God’s plan, because Judaism was pointing to the fulfillment of Jesus as the Messiah. Everything found in the Old Testament, including the animal sacrifices, was pointing to something yet to be fulfilled—and that something was Someone. Jesus did not come to do away with the law but to fulfill it. He did that at the cross and His resurrection. May God help us to go where He wants us to go, to whom He wants us to go, with the message He wants us to bring. So many have not yet heard the gospel. May we be the instruments He would use to bring the gospel to them. 2 Peter 3:9 (NIV) The Lord is not slow in keeping his promise, as some understand slowness. Instead he is patient with you, not wanting anyone to perish, but everyone to come to repentance. Con amor eterno te he amado; por tanto, te prolongué mi misericordia. Si Dios es el Creador de mundo, si es el que nos creó, nos separó y escogió como sus hijos, nos dejó un libro lleno de promesas que hablan cosas maravillosas y positivas, no nos dejemos vender otras falsas ideas. Cuanto más dudas de su poder, más difíciles se pueden volver tus situaciones. Recuerda que esto de no temerles a las circunstancias no es de un día para otro. Se trata de un fruto que es producto de estar conectados con Dios. Entonces, poco a poco, aprendemos a confiar en Él, de manera que cuando lleguen los problemas, no tendremos miedo ni terror. Por el contrario, sabremos que aunque la situación es fuerte, Dios es más poderoso que cualquier mala noticia o problema. Dios es tu ayudador y te ama. So Peter was kept in prison, but the church was earnestly praying to God for him. Nadia was in a prison in the Middle East for some months because she was a believer from Muslim background. She told the prison officials that she would not give them any information about the people she knew or about her husband, only about herself. This led her to being placed in an isolation cell for four days. The cell was small and extremely cold. There was no toilet or washing facilities at all. She had no idea where the warmth was coming from and at the same time she became very joyful. This sense of joy overwhelmed her so much that she began to dance in the cell. Yet, at the same time, she also felt confused. How could she feel warm and joyful in a cold prison cell, she asked herself? Later on, after her release, Nadia shared her amazing experience in the cell with her sister. Asking when it had happened, Nadia’s sister mentioned the same exact day and time when thirty-two believers had met to pray for Nadia and another believer in prison. Two of the participants had been appointed to represent Nadia and the other Christian. The remaining thirty believers gathered around them to ask God to comfort them, to fill them with joy and send His Spirit of happiness upon them.” They were deeply encouraged to hear Nadia’s experience. Pastor Gambo and the other five Christians left the court singing, thanking God for His intervention. RESPONSE: Today I will remember that God’s promises are true and He still performs miracles. PRAYER: Pray earnestly today for Christians around the world in prison for their faith. I am the middle child of five born to my parents in eight short years. Our house buzzed with activity, sibling rivalry, and noise. Stadiums full of noise. I was one girl among a handful of kids who wanted to catch the eye of my busy, work-a-holic daddy. While I knew he loved me, I wanted so much more from him. I wanted to hear his love, to feel his love, to be sheltered by his love, and to be adored. One of my favorite childhood memories is of the times in summer when my big, strong dad would take both of my hands in his and then begin to spin. Running in circles around him, I would quickly gain momentum and take flight. Round and round we would go. Pure delight. My heart soared with the wild, dizzy adventure of it all as my brown eyes laughed with his blue eyes, shrinking to crescents of joy. And when the moment was over I wanted more. Again, Daddy! I would beg. Please? Just one more time! I wanted more of the love. More of the adventure. More of the joy that centered on the attention of my father. I wanted more than any human or any adventure could ever give. I often look to my husband, children, friendships, status, career, wallet, or waistline to fill this ache that drives me. When will I learn that my people, positions, and possessions are not my God? I am so thankful that the Bible reminds me of this intensely personal truth: God is my heavenly Father – my Abba Father – who loves me in the way I’ve always wanted to be loved. Perfectly. All-sufficiently. We women need to know this. To grasp this. To accept this. To embrace this. I do want the love of my people. And that’s okay. But I cannot expect that the imperfect nature of humanity, relationships, and this world can satisfy my deepest heart cravings. Only God can satisfy. This love. This sacred, scarlet love of Jesus is the only water that can quench the desperate longings of my thirsty soul. His is the only love that satisfies. To grasp the love God has for me, my feeble hands must reach for the ones that were pierced for my transgressions. Reach for them with me. Dear Lord, You are perfect love…and all that my soul longs for. When I am dizzy with discontent, please remind me that Yours is the love that satisfies. How personally do you take God’s love? Is it hard for you to imagine? Me too. But truth is truth. We need to take God at His WORD! Read and meditate on these verses: Ephesians 2:4-5, 1 Peter 5:6-7, Psalm 86:15 and Zephaniah 3:17. GIVEAWAY: Journal a one-sentence summary that encapsulates the truth of God’s love for you. Then tell me your one sentence summary! Leave it as a comment on my blog or Facebook page! 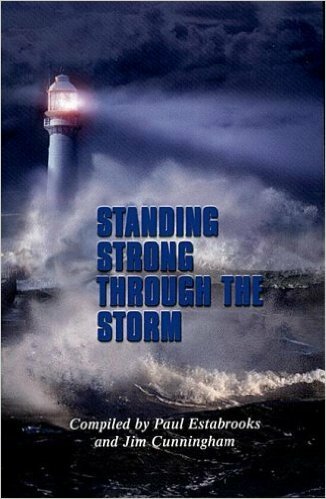 I will be picking 3 random one-sentence-summaries to receive a FREE digital download of the songs from My Strength, My Song CD. Gwen Smith is a speaker, worship leader, songwriter, and author of the new book, I Want I ALL, which includes a Bible Study Guide right in the back of the book; no extra purchase required. I WANT IT ALL it’s easy to read yet contains compelling and challenging content. You'll connect with the stories, probably dust off a few heart dreams, think bigger thoughts of God, laugh and smile a lot, search your soul, and even cry a little ... because each page lovingly directs you to the personal grace and truth of JESUS. 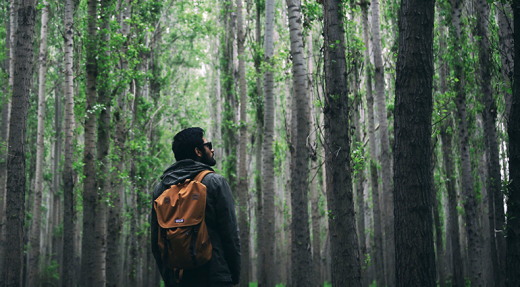 LHM Daily Devotion - June 28, 2017 "Something New"
Among the qualities that many people like about Jesus is the fact that He didn't get carried away by the glitz and glitter of popularity. According to the common and more prevalent thinking, Jesus is a kindly character, a Mr. Rogers kind of guy: always supportive, never negative, never judgmental, and certainly never rebuking, reprimanding, or reproaching. That's the kind of Jesus people like -- a Jesus who accepts them just the way they are. If that is the Jesus you know, I'd like you to hear these words taken from the first chapter of Mark. Mark wrote, "Jesus came into Galilee, proclaiming the Gospel of God, and saying, 'The time is fulfilled, and the kingdom of God is at hand; repent and believe in the Gospel.'" Did you get that? Probably not. Those are a lot of words, and I said them pretty fast. Here, let me shorten it up a bit: Jesus came saying, "Repent and believe in the Gospel." 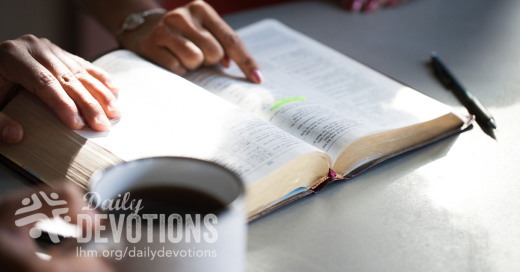 If you're listening to this devotion with half an ear, or reading with just one eye, I can almost see you sit up a little straighter. Your face has an expression which says, "I'm not sure if I heard Him right." Well, you heard correctly. Jesus said we should repent. Nowadays people hear all kinds of Christian sermons, messages, and devotions about believing. But listen as much or as long as you like, there won't be many sermons, messages, and devotions about repentance. Do you wonder why? Easy, because people don't want to hear sermons about repentance, and many preachers aren't overly eager to preach about it. These men of the cloth know that most people like to think of Jesus as a person who is committed -- even obligated -- to taking all of us ... just the way we are. Right now, if I listen carefully, I can almost hear people stutteringly say, "But ... but ... doesn't Jesus take me the way I am? Won't He accept me the way I am?" And the answer is Yes! -- absolutely, positively, unequivocally, yes! Jesus took the lepers and the lame the way they were; He took the cripple and the crucified criminal the way they were. Jesus took the publican and the prostitute, the sinner, the slave, and those troubled in spirit, the way they were. Throughout history there has never been anyone so sad and sorry, so pitiful and pathetic, that Jesus will not accept him. Yes, Jesus accepts sinners, and then ... and then He changes them. My friend, believe it. Jesus will accept you the way you are, but He will not leave you the way you were. As I read through Scripture, the truth of that statement is proven in one changed-life story after another. Read through Scripture, take a look. God's people are changed people, and they are glad of it. They are glad because, with faith in Jesus, the old is gone and the new has come. Descarguen en él todas sus angustias, porque él tiene cuidado de ustedes. Los defensores de derechos de los animales estarán muy complacidos al saber que un médico de Chicago ha dejado de utilizar perros en un programa de investigación sobre úlceras estomacales. La razón no tuvo nada que ver con los sentimientos de culpa del médico, sino con que los perros simplemente se negaron a estar tensos y preocupados, dos condiciones casi esenciales para sufrir de una úlcera. El médico dijo: "Si a un perro le provocamos una úlcera por medios artificiales, él se sentará y dejará que su cuerpo se cure a sí mismo, negándose a dejarse afectar por medios externos de preocupación". ¡Qué bueno sería si los seres humanos tuviéramos la misma sabiduría que los perros! El ser humano vive preocupado. Nos preocupamos mucho, por numerosas cosas y por largos períodos de tiempo. Y, aunque la realidad es que no podemos sentarnos y dejar que nuestro cuerpo se cure a sí mismo negándonos las preocupaciones, sí existe una solución al problema de la preocupación: podemos entregarle a Dios nuestros problemas. Eso es lo que San Pedro, inspirado por el Espíritu Santo, aconseja hacer a los cristianos y, quienes siguen su consejo, descubrirán que su amantísimo Salvador realmente los cuida. Él está pendiente de los problemas, dolores, heridas y preocupaciones de cada uno de nosotros. Jesús vivió, murió y resucitó para mostrarnos que a él le importa nuestro destino eterno... pero también le importa nuestro presente de cada día. Propongámonos hoy depositar toda nuestra ansiedad sobre él. At his death, the great artist Michelangelo left many unfinished projects. But four of his sculptures were never meant to be completed. The Bearded Slave, the Atlas Slave, the Awakening Slave, and the Young Slave, though they appear unfinished, are just as Michelangelo intended them to be. The artist wanted to show what it might feel like to be forever enslaved. Rather than sculpting figures in chains, Michelangelo made figures stuck in the very marble out of which they are carved. Bodies emerge from the stone, but not completely. Muscles flex, but the figures are never able to free themselves. My empathy with the slave sculptures is immediate. Their plight is not unlike my struggle with sin. I am unable to free myself: like the sculptures I am stuck, “a prisoner of the law of sin at work within me” (Rom 7:23). No matter how hard I try, I cannot change myself. But thanks be to God, you and I will not remain unfinished works. We won’t be complete until heaven, but in the meantime as we welcome the transforming work of the Holy Spirit, He changes us. God promises to finish the good work He has begun in us (Phil. 1:6). God, thank You that You make us new creatures through the work of Your Son Jesus Christ, freeing us from our slavery to sin. 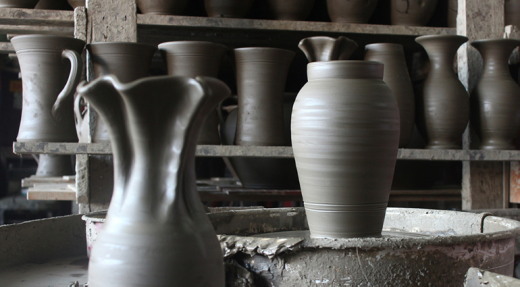 He is the potter; we are the clay. Com o passar dos anos, tive o privilégio de liderar diversas viagens para as terras bíblicas. Nos meses antes das nossas partidas, fazíamos uma série de reuniões de orientação, como preparação para a viagem. Planos, horários, acomodações de hotel, informações de contato — tudo podia sofrer alterações com qualquer notícia inesperada. Por essa razão, a flexibilidade era algo que sempre se destacava em nosso tempo de preparação. A disposição de aceitar as circunstâncias e de se ajustar a qualquer mudança que pudéssemos encontrar era de grande valor. A vida tem imprevistos para os quais a melhor resposta é a flexibilidade. Tiago falou sobre flexibilidade no capítulo 4 de sua carta. Embora seja sábio planejar o futuro, devemos fazê-lo conscientes de que os propósitos de Deus podem ser diferentes dos nossos. Em vez de dizer simplesmente: “Hoje ou amanhã iremos para esta ou aquela cidade” (v.13), Tiago nos aconselhou a sermos flexíveis em relação à direção de Deus em nossa vida. E afirmou: “Em vez disso, devíeis dizer: Se o Senhor quiser, não só viveremos, como também faremos isto ou aquilo’” (v.15). O desejo de seguir a Cristo nos faz descansar em Seus planos perfeitos — e a flexibilidade nos ajuda a estar preparados para irmos a qualquer lugar para onde Ele nos levar. O coração do homem traça o seu caminho, mas o Senhor lhe dirige os passos. Lúc qua đời, nghệ sĩ vĩ đại Michelangelo đã để lại nhiều dự án dang dở. Nhưng có bốn tác phẩm điêu khắc mà ông không hề có ý định hoàn tất, đó là: Người Nô Lệ Có Râu, Người Nô Lệ Atlas, Người Nô Lệ Tỉnh Giấc và Người Nô Lệ Trẻ. Dù có vẻ như còn dang dở, nhưng đó là ý định của Michelangelo. Ông muốn thể hiện cảm giác khi bị làm nô lệ mãi mãi. Thay vì điêu khắc những bức tượng có dây xích, Michelangelo đã để các bức tượng kẹt trong đá cẩm thạch mà chúng được chạm khắc. Hình dáng thân thể hiện ra trên đá, nhưng không trọn vẹn. Các cơ bắp gập lại, nhưng các bức tượng này không bao giờ có thể tự giải phóng mình. Tôi đồng cảm với các bức tượng người nô lệ ngay lập tức. Cảnh ngộ của họ không khác gì trận chiến giữa tôi với tội lỗi. Tôi không thể tự giải thoát: Như các tác phẩm điêu khắc, tôi bị mắc kẹt, làm “nô lệ cho luật của tội lỗi, là luật ở trong chi thể tôi” (Rô. 7:23). Dù cố gắng thế nào, tôi cũng không thể thay đổi bản thân. Nhưng tạ ơn Chúa, bạn và tôi sẽ không còn là tác phẩm dang dở nữa. Chúng ta sẽ không trọn vẹn cho đến khi lên thiên đàng, nhưng ngay trong lúc này, nếu chúng ta đón nhận công tác biến đổi của Đức Thánh Linh, thì Ngài sẽ biến đổi chúng ta. Đức Chúa Trời hứa sẽ hoàn thành việc lành mà Ngài đã bắt đầu trong chúng ta (Phil. 1:6). Lạy Chúa, cảm ơn Ngài đã khiến chúng con trở nên những tạo vật mới qua công tác của Con Ngài là Chúa Jêsus Christ để giải phóng chúng con khỏi ách nô lệ của tội lỗi. Ngài là thợ gốm; chúng con là đất sét. … ¿Quién me libertará de esta vida dominada por el pecado…? […] Jesucristo nuestro Señor… (vv. 24-25 NTV). Al morir, el gran artista Miguel Ángel dejó muchos proyectos sin terminar. Sin embargo, cuatro de sus esculturas quedaron incompletas a propósito. El Esclavo barbudo, el Esclavo atlante, el Esclavo despertándose y el Joven esclavo, aunque parecen obras sin terminar, son exactamente lo que Miguel Ángel tenía en mente. El artista quería expresar la sensación de estar esclavizado para siempre. En lugar de esculpir figuras encadenadas, Miguel Ángel las modeló atascadas en el mismo mármol del cual las talló. Los cuerpos emergen de la piedra, pero hasta cierto punto. Los músculos se contraen, pero las figuras nunca pueden liberarse. Me resulta fácil identificarme con estas esculturas de esclavos. Su situación no es tan diferente de mi lucha con el pecado. No puedo liberarme. Al igual que las esculturas, estoy atrapada, cautiva «a la ley del pecado que está en mis miembros» (Romanos 7:23). No importa cuánto me esfuerce, no puedo cambiar. Pero, gracias a Dios, no quedaremos incompletos para siempre. En el cielo, seremos una obra completa, pero, mientras tanto, al permitir la obra transformadora del Espíritu Santo, Él nos cambia. Dios promete perfeccionar la buena obra que comenzó en nosotros (Filipenses 1:6). Señor, gracias por transformarnos en nuevas criaturas a través de la obra de tu Hijo Jesús. Él es el alfarero; nosotros somos el barro. Nach seinem Tod hinterließ der große Künstler Michelangelo eine ganze Reihe unvollendeter Projekte. Vier seiner Skulpturen sollten jedoch von vornherein nie fertig gestellt werden. Der „bärtige Sklave“, „Atlas“, der „erwachende Sklave“ und der „junge Sklave“ wirken zwar unvollendet, sind aber genau so, wie Michelangelo sie gewollt hat. Der Künstler wollte damit zeigen, was es bedeutet, für immer versklavt zu sein. Anstatt Figuren in Ketten zu gestalten, schuf er Körper, die in dem Marmor, aus dem sie gehauen wurden, quasi stecken geblieben sind. Sie treten aus dem Stein hervor, aber nicht ganz. Man sieht die angespannten Muskeln, aber sie können sich nicht selbst befreien. Ich verspüre sofort Mitleid mit den Sklaven-Skulpturen. Ihr Schicksal erinnert mich an meinen Kampf mit der Sünde. Ich kann mich nicht selbst befreien. Wie die Skulpturen stecke ich fest, „gefangen im Gesetz der Sünde, das in meinen Gliedern ist“ (Röm. 7,23). Egal, wie sehr ich mich bemühe, ich kann mich nicht selbst ändern. Aber Gott sei Dank, dass weder du noch ich unvollendet bleiben müssen. Wir werden zwar erst im Himmel ganz vollkommen sein, aber in der Zwischenzeit tut der Heilige Geist sein veränderndes Werk an uns, wenn wir ihn wirken lassen. Gott hat versprochen, dass er das gute Werk, das er in uns angefangen hat, auch vollenden wird (Phil. 1,6). Herr, hab Dank, dass du uns durch das Werk deines Sohnes Jesus Christus von unserer Versklavung an die Sünde frei und zu neuen Menschen machen willst. Gott ist der Töpfer, wir sind der Ton. Au moment de sa mort, le grand artiste Michel-Ange a laissé derrière lui de nombreux projets inachevés. Il faut quand même savoir que, dans le cas de quatre de ses sculptures, il n’a jamais eu l’intention de les terminer. Bien que L’esclave barbu, L’esclave Atlas, L’esclave s’éveillant et Le jeune esclave puissent sembler inachevés, ces oeuvres sont telles que Michel‑Ange les a voulues. L’artiste désirait ainsi illustrer le sentiment qu’un esclavage sans fin pouvait faire éprouver. Au lieu de sculpter des personnages enchaînés, Michel‑Ange les a voulus captifs du marbre même duquel il les sculptait. Des corps émergent de la pierre, mais pas entièrement. Les muscles se contractent, mais sans jamais permettre aux personnages de se libérer. La vue de ces sculptures d’esclaves suscite immédiatement de l’empathie en moi. Leur sort ressemble à mon combat contre le péché, en ce sens que je ne parviens pas à m’en libérer. Comme ces sculptures, je suis captive, mais « de la loi du péché, qui est dans mes membres » (RO 7.23). Malgré tous mes efforts, je ne réussis pas à changer. Dieu merci, vous et moi ne resterons toutefois pas inachevés éternellement, car notre entrée au ciel mettra un terme à notre condition terrestre. Entre‑temps, Dieu nous transforme à mesure que nous accueillons l’oeuvre transformatrice du Saint‑Esprit en nous. Dieu ne nous a‑t‑il pas promis de rendre parfaite la bonne oeuvre qu’il a commencée en nous (PH 1.6) ? Il est le potier, nous sommes l’argile. Після смерті Мікеланджело залишилось багато незавершених проектів. Але чотири його скульптури ніколи й не планувалися бути завершеними. Це – “Бородатий раб”, “Раб Атлант”, “Молодий раб” і “Раб, що прокидається”. Вони залишились незакінченими, бо так планував сам Мікеланджело. Цим великий митець хотів показати, що значить бути вічним невільником. Замість того, щоб зробити фігури в кайданах, Мікеланджело залишив їх частково у шматку мармуру, з якого висікав. Фігури не повністю “звільнені” з цього білого каменя. М’язи напружені, але звільнитись вони з кам’яної пастки не можуть. Я розумію зміст мармурових скульптур. Їхнє жалюгідне становище не дуже відрізняється від моєї боротьби з гріхом. Я неспроможна звільнити сама себе. Я не можу звільнитись від гріха, який “полонить мене законом гріховним, що знаходиться в членах моїх” (Рим. 7:23). Скільки б я не докладала зусиль, не маю жодного шансу змінитись всередині. Але, дякувати Богу, ані ти, ані я не залишились назавжди незакінченим проектом. І хоча повне завершення нас, як Божого шедевра, станеться лише на небесах, ми вже на землі змінюємося завдяки праці Святого Духа, Хто преображає нас духовно. Бог пообіцяв обов’язково довести до кінця ту справу, яку розпочав у нас (Фил. 1:6). Боже, дякуємо Тобі за те, що робиш нас новим творінням, завдяки викупній праці Сина Твого Ісуса Христа, Хто звільняє нас від гріховного рабства. Бог – гончар, а ми – глина. Умирая, великий художник Микеланджело оставил много незавершенных трудов. Однако четыре скульптуры остались незаконченными умышленно, по замыслу создателя. «Бородатый раб», «Раб Атлант», «Просыпающийся раб» и «Молодой раб» хоть и выглядят так, будто скульптор остановился на полпути, но они должны быть именно такими. Художник хотел показать, как ощущается вечное рабство. Вместо того чтобы изваять скульптуры в цепях, Микеланджело создал свои статуи частично погруженными в тот самый мрамор, из которого они высечены. Тела увязли в камне. Мышцы напряжены, но статуям не суждено освободиться. Мне близки эти древние скульптуры. Их усилия похожи на мою борьбу с грехом. Я не могу освободиться сама. Подобно им, я стала «пленником закона греховного, находящегося в членах моих» (Рим. 7:23). Как бы я ни старалась, мне не изменить себя. Но, благодарение Богу, мы не останемся незавершенной работой. До встречи со Христом во время Его Второго пришествия мы не достигнем полноты, но под животворящим действием Святого Духа христиане преображаются. Бог обещает завершить начатое в нас доброе дело (Флп. 1:6). Боже, благодарим, что Ты сделал нас новым творением через труд Твоего Сына Иисуса Христа, освободив нас от рабства греха. Он – горшечник, мы – глина.